JIIT has been developed as a modern world class campus, with intellectually vibrant ambience in a serene and lush green environment. 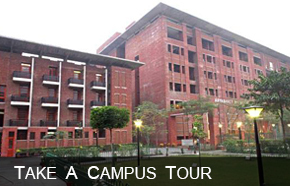 It has two campuses at Sector-62 & Sector-128 Noida respectively. The state-of-the-art campuses comprising smart buildings with Internet, with Wi-Fi connectivity, including environmentally conditioned Academic Block, Annapurna (Mess), well-equipped modern laboratories, Learning Resource Centre, Faculty and student residences provides a pleasant and intellectually stimulating ambience for students in an eco-friendly environment.